Could this Christmas Bird be any sweeter? I just love this tag featuring this outstanding stamp by Mary Vogel Lozinak. Check out all of her stamps at the Queen Kat Design Store. Just follow the Christmas Bird link! 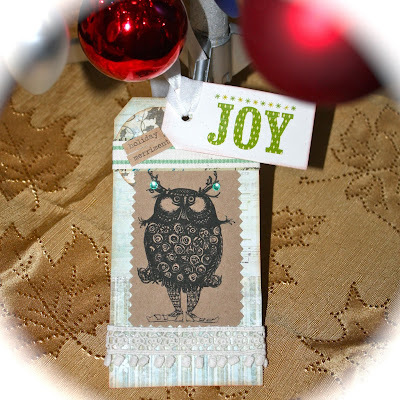 This is a fabulous tag that I am planning to give to a teen age young lady our family is helping for Christmas. Guess what she wanted? Art supplies……. She is going to be in for a special treat that we all hope she enjoys. Best wishes to all of you as you prepare for the holidays! This is great - i love that it has a non traditional feel but is still perfect for xmas! Love the bling too. Merry Christmas from Queen Kat Designs!! !